That quote comes about as close as one can to defining cinema. 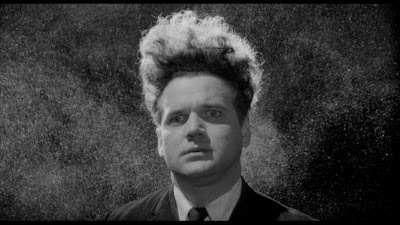 And by that standard, I found Eraserhead to be a rather empty exercise. It's not that I can't roll with surrealism, or even David Lynch's specific brand of cinema (I absolutely, wholeheartedly love Mulholland Dr.). Hell, I'm even okay with what he's getting at here, even though no one will probably ever really know what he's getting at here. But I'm totally okay with that. My problem with the film is that it didn't work on any level beyond confusion. I love being confused by movies, entranced by their mystery; I hate it when things like this end up explained. But it was all confusion, no mystery - it never felt like something was at the core here, like there was something essential to express. There was nothing to latch onto. I felt like the film was trying to scare me, and I was never actually scared. I was never worried or anxious. I didn't leap for joy or fall into a pit of despair, or any of the tepid feelings between the two. I just sat there, took it in, and when it was over, I threw it back in the Netflix envelope and put it in the mail.